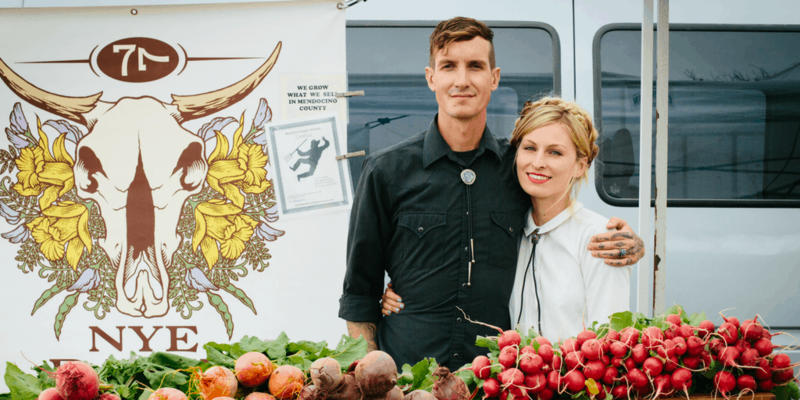 Mendocino farmers Kyle and Mel Burns grow over 300 different varietals of vegetables and flowers on a plot of land near the ocean that they once thought could only bear peas and potatoes. Lucky for us they persevered and now share their bounty with grateful local residents only too happy to indulge in their fresh fruits, vegetables and flowers that they carefully and thoughtfully grow on their flourishing farm. Kyle & Mel: Being a small scale and biologically intensive-highly diversified vegetable, berry and cut-flower market farm we are constantly busy with different tasks. Today we’re foliar feeding strawberries, direct seeding arugula, carrots and radish, potting-up tomatoes, summer squash and cucumbers, planting rainbow chard, brassicas and lettuce, trellising sugar snap peas, flail mowing cover crop, weeding stock flowers, bupleurum, ornamental kale, sweet peas, and dianthus. Our hands are always busy and always dirty. Kyle & Mel: Wow so many things! First off, walking our farm in the golden-pink light of the sunrise and sunset everyday fills us with so much gratitude and love for the land. It’s hard to beat the beauty of plants blossoming, frogs singing, and grey whales tooting by on the ocean’s horizon, all while we’re stuffing our faces with strawberries and wind-salted broccoli flowers. Secondly, we absolutely adore our farmer’s market and farm stand customers! Our tiny community really cherishes the work that we do and is always letting us know how happy they are that we’re doing what we’re doing. Literally every farmer’s market they melt our hearts with their kindness and appreciation. That kind of thing is so good for the soul and keeps us motivated on the really tough days of farming. I guess you could say we feed off of feeding our community. Kyle & Mel: Growing organically and sustainably with regards to all the creatures in our landscape is huge for us and the Mendocino Coast. When we first started farming here (1,200 feet from the ocean with no wind breaks) there was a lot of doubt that we could be anything but a pea and potato farm. We have since showcased the miracles of building soil health and grow over 300 varietals of vegetables and flowers! We enjoy exchanging knowledge with the local home gardeners on which plants we have had success with in this environment and hold a yearly plant sale in the spring with our favorite varieties. We also donate produce to the Senior Center during our abundant summer months which provides free hot lunches for anyone over 60. Kyle has recently become the new Coastal Representative for the Mendocino County Farmers Market Association, helping to strengthen and build the coastal markets. Kyle & Mel: When Mel got a summer job on an organic flower farm in Chico, Ca while she was in college it completely changed her perspective on quality of life. Working outdoors all sweaty and covered in dirt and sunshine felt like a relief. Kyle grew up gardening and never stopped. Being homeschooled he spent most of his time outdoors and always knew that was his place. Maybe it sounds cheesy but connecting with and learning from the plants and elements makes us feel at home on this planet and in our bodies. Kyle & Mel: Our spare time activities vary with the season. In the fall and winter, we are usually in the woods mushroom foraging, in the spring we seek out wildflower shows and, in the summer, we are picking huckleberries, rock fishing and camping if we find a night off. On a more regular basis though we play with our pup on the beach, bike along the headland trails at MacKerricher State Park drinking a well-deserved beer and we take a lot of photographs. Kyle & Mel: Celebrate every little victory and learn to laugh at your mistakes! Remember to step back and be proud. Eat snacks if you’re tired and grumpy. If you are farming with a partner, learn what tasks you enjoy doing together and which ones make you want to kill one another. Don’t do the latter tasks together. Ask for advice from more experienced farmers when you need it and don’t forget to stretch. Kyle & Mel: Last year Nye Ranch received grant funding from the NRCS (Natural Resources Conservation Service) to plant a Pollinator Hedgerow around the entire farm. The hedgerow incorporates native plants and provides flower forage for all the beneficial insects and small creatures that live on the farm and the surrounding area. The goal is to always have some plants in bloom, therefore providing a year-round supply of food for the bees, butterflies, moths, and hummingbirds. We also focus on pest prevention (strengthening plants with compost tea, building healthy soil and giving beneficials a home) instead of pest control. If there comes an imbalance it usually works itself out if you’re patient. The ladybugs and frogs always show up if you provide for them.